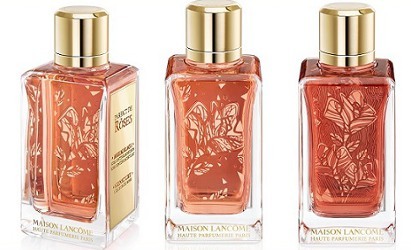 Lancôme has launched Parfait De Rôses and Rôses Berberanza, new additions to the Les Parfums Grands Crus collection. Parfait De Rôses ~ A fruity floriental developed by perfumer Nathalie Lorson, with rose centifolia, pink pepper, labdanum, vanilla, tolu balsam and incense. Rôses Berberanza ~ A spicy gourmand floriental developed by perfumer Julien Rasquinet, with mandarin, raspberry, damask rose, saffron, spices, pistachio, vanilla and oud. Lancôme Parfait De Rôses and Rôses Berberanza are available in 100 ml Eau de Parfum, €180 each. I would try these if I ever saw them. I often like gourmandy roses. And Lancome does a good rose (although I say that pretty much based on Mille et Une). Ooh, hopefully South Coast Plaza Nordstroms will have these, they have the others. They sound nice!